A street party is getting underway here in St. Paul to celebrate a collection of poems by local residents that's been published on paper - and in cement. For the last few months the city has been implanting poems penned by St. Paulites in freshly poured sidewalks all over town. The public art project is designed to engage residents' artistic impulses and bring more poetry into everyday life. Chris Roberts of Minnesota Public Radio has the story. People in St. Paul now have to watch their step when they go for a walk. They may stumble across a poem. It happened to Patty Zurlo, who was on a stroll with her dog the other day. "I'm walking down the sidewalk, looking down as you do in Minnesota," she says. Zurlo's making fun of how Minnesotans generally don't like to make eye contact on the street. Anyway, she's looking down. "And here I see, 'Second Love,' " she says. It was an exciting discovery for Zurlo, who immediately envisioned guerrilla poets with engraving tools, stalking the neighborhoods of St. Paul. When told it was a city-sponsored installation, she felt a little let down. "I thought it was like, people were finding out when the sidewalks were being replaced and then sneaking in in the middle of the night and doing this, but now you're saying they're on the city payroll," she says. "It's a little less romantic now, but still very cool." The project is being funded by a local public art group, with the city's blessing. Marcus Young is St. Paul's Artist-in Residence. Young too was walking down the sidewalk, head-down in Minnesota fashion, when he began to notice how construction companies stamp their work. "It'll say Knutson Construction, or Standard Sidewalk, and one day I just thought 'Hey, that's an opportunity for art,'" he says. So Young invited residents to submit their verse, limited to 150 characters or less. 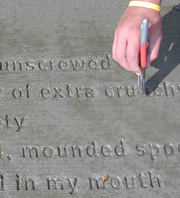 The 20 winning poems are being stamped on fresh sidewalks throughout St. Paul. "I reach for a name, a song, a tune, and memories scatter," recites Naomi Cohn. She is also looking down at the sidewalk. It contains her poem "Dementia." It's dedicated to her father, who struggled with his ability to think and remember as he got older. "Memories scatter. Minnows fleeing a toothy pike. I catch a few laggards, but know these are nothing to the hundred fish that fled." Cohn wrote this poem a while ago in a workshop. She knows it's sad, but she's happy it's being published in cement. "I think it just puts it in a different place where it's free and open," she says. "You don't have to go to a reading or coffeeshop or library or a space that has a certain approach to it." There's another sidewalk poem a few blocks away from Cohn's. It goes "A little less war, a little more peace. A little less poor, a little more eats." Ten-year-old Daijon McDonough has passed over it many times, walking down his block. "I like it because it's true and poor people do need to eat food, and stuff," he says. Daijon thinks the sidewalk poems bring a lot to his neighborhood. He likes how some of them share wisdom or lay out a path to follow. He even protected one as it was drying. "When it was wet cement my friend almost stepped on this, and I said 'Don't step on that 'cause that is beautiful work that people worked on a lot,'" he explains. That poetry stamping work will continue through October. Then there's the question of whether the poems can survive the freeze/thaw cycle of a Minnesota winter. But organizer Marcus Young says the project has already provided a new way to look at sidewalks; as blank pages. "And if you accept that the sidewalk panel is a blank page," he says, "then we have this amazing book� that is our city." Super great idea. I hope to be able to get a similar project moving in out town. Thanks for the great "heads up" idea's and who to contact to start it rolling. Didn't have to reinvent the wheel thanks to your mentioning this program. A delightful project. But now watch the city figure out that they can sell the idea to advertisers. This sidewalk poetry is so inspirational. I read all 20 poems & really enjoyed them. I wish more cities would develop this idea. This sidewalk poetry is so inspirational. I read all 20 poems! I wish all cities could do something of this nature.